Plasterboard systems specialist, Gyproc Middle East, is about to launch a ground-breaking recycling service for customers that will see site waste plasterboard reprocessed and recycled into new plasterboard – saving expensive landfill costs and helping to increase valuable sustainability ratings for projects. The UAE is growing faster than ever before. With the pressure on to build more hospitals, more schools and more hotels to service both our growing aspirations and growing visitor base, our construction industry has never been busier. Whilst that’s good for our region, there is a downside - we are producing waste at an unsustainable rate. Experts have predicted that, by 2017, the UAE alone will be producing almost 8.5 million tonnes of waste every year. We simply do not have the infrastructure to handle this volume of waste, and already our landfill capacity is close to full. It has been estimated that the construction industry generates a massive 65% or so of all non-residential waste in the UAE, with construction sites and demolition the biggest offenders. As a result, the authorities have targeted the industry through new legislation and ever increasing waste disposal costs for contractors and building clients. To address this issue, Gyproc has been working closely with the industry and Tadweer, the Abu Dhabi Centre for Waste Management, to reduce the amount of plasterboard waste produced and dumped. This involves a three-pronged attack. Firstly, reducing the amount of offcuts through improved system design and product engineering, and through training and support on site; secondly, promoting reuse of offcuts where possible and thirdly, recycling any waste and offcut plasterboard that is created, into new high quality boards. The company has been recycling its own manufacturing waste for some time, but the new service will go one step further, allowing the company’s customers and contractors to deliver any clean site waste and offcut plasterboard to Gyproc’s plant to be recycled into new plasterboard. What the new service means to the contractor? 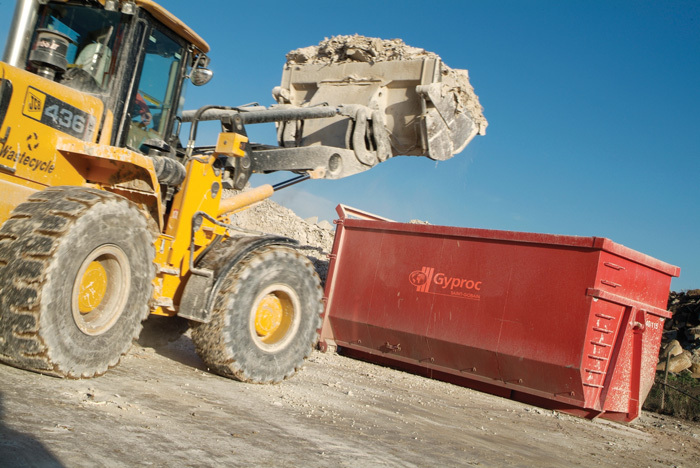 To the contractor, the benefits of Gyproc’s new Recycling service will be far reaching. Of course, there will be the purely financial benefit of reduced disposal costs - and this, in itself, will become more significant as landfill costs continue to rise. It will also add valuable additional credits under green building certification schemes, such as LEED and ESTDAMA – helping to meet the region’s ever more demanding sustainability targets. Perhaps not so obvious initially are the benefits that such schemes bring in improving site safety and practices and increasing environmental awareness. Experience has shown that segregating plasterboard waste on site helps to create new working systems; tidier sites with fewer slips, trips and falls, and an improved appreciation of environmental issues both at site management and installer level. As Gyproc will carefully weigh and monitor all of the waste they receive, the data will be fed back to the contractor for feeding into green building calculations and to help identify and address areas of the site, or specific operations, that produce high levels of waste. This should enable overall waste volumes to be reduced, saving further cost for the project. As well as cost reductions for the project, there are big benefits for Gyproc who is able to process the reclaimed plasterboard and feed it back into the manufacturing cycle. This not only has direct cost implications, but helps to improve the sustainability credentials of the products and reduce future demand on raw materials. For the region, it will help to reduce the pressure on our diminishing landfill facilities, and go some way to meeting increasingly onerous sustainability targets. To participate in the new Recycling scheme, contractors must first set up the necessary arrangement with Gyproc and ensure they have a system in place to enable plasterboard waste and offcuts to be segregated and managed independently of other site waste. All that is needed then is for them to liaise with Gyproc and their own waste management company to collect and deliver the waste plasterboard to a special facility at Gyproc’s Abu Dhabi plant. At the plant, all waste will be weighed and monitored so that data can be fed back to the contractor and to Tadweer, the authority responsible for monitoring and reducing all waste activity in the Emirate. The reclaimed board will then be processed and recycled into the new board manufacturing process at a predetermined rate, so as to ensure that all new board produced will meet Gyproc’s demanding performance and appearance standards. Contractors wishing to find out more about the new service can speak to Gyproc Toll Free on 800 497762.